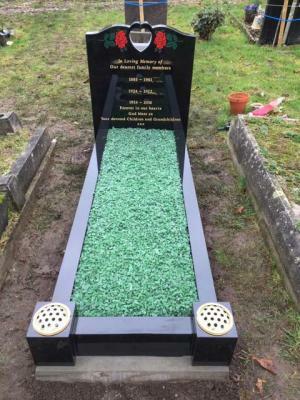 This highly polished black granite memorial shows a cut out heart shape within the profile of the headstone shape, sandblasted and painted rose designs enhance the shape.Green chippings finish off the garden area of this stunning memorial. 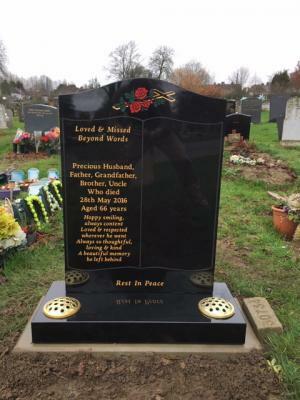 This black granite memorial has a outline book design with a cross & rose design to the top centre, finished with a ground anchor system and space on the right hand page for a further inscription. 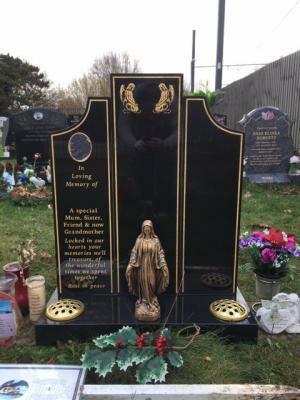 This memorial is a wonderful example of a three panel memorial, all showing a gold keyline and gold Angels, the shaped wing panels are used to display the inscription. The 'Our Lady' statuette in bronze effect finishes off this memorial. Matching gold topped flower containers allow for plenty of space for flowers to be displayed.